What zip did you find this under? Thanks! My coupons say Redeemable at Walmart. Will they still honor them? In my experience, the Cartwheel discount is deducted after all other coupons. In this case, that would mean a discount of .64, after the Target and Manufacturer coupons are deducted. Is this the way it’s been showing up for other shoppers? I bought these yesterday, wouldn’t you know it, but the cartwheel doesnt work for these. It didn’t take it off and doesn’t find a match if you search by barcode either so customer service said it’s only for the bigger jars as pictured. They come up when scanning by barcode. I bought the 16oz jars yesterday, and the Cartwheel discount did not come off. Maybe it’s meant for the larger containers?? I purchased these yesterday as well and will be going back to use the cartwheel as it did not come off at the register. I had a problem yesterday with the cartwheel, but they checked and did it manually, Today I used the better coupons, and had the same problem, and they applied it manually. My receipt shows that the cartwheel came off first, then the manufacturer’s coupons, then the target coupon. I do not think it matters in what order they scan everything: the cartwheel discount comes off before coupons. I just checked yesterday’s receipt, and yes, the cartwheel discount came off before coupons. If the cartwheel does not come off, you need to bring it to the attention of the cashier, and have them apply it. 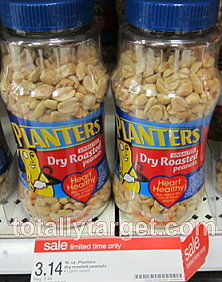 My cartwheel says 34-35 oz peanuts. Only looked at it today, maybe that’s why it didn’t come off yesterday. Suspect they added the text to correct it. So, this is no longer good to use on the smaller peanuts. post updated- thanks for letting me know the cartwheel has been changed.